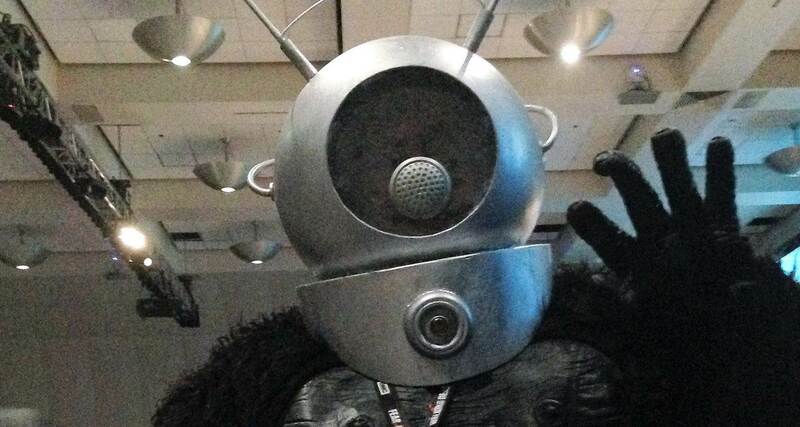 Photo of the author in costume at San Diego Comic-Con. Once in a while, a guy gets an urge and has to act on it. You see something and you just know it’s perfect and it’s something you have to do. So you do, and it works out better than you could have hoped. It happens that the company I work for makes a lot of different products for retailers; displays and fixtures for merchandising, racks and shelves and stuff like that. 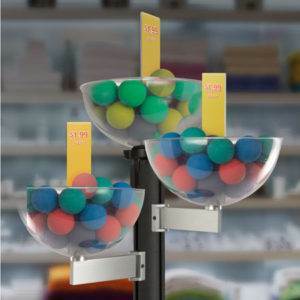 One of the things they sell is these plexiglass bowls that sit on the end of a stanchion, that stores can fill up with toys or soap or whatever. Last year, they redesigned the bowls, made them a little flatter on the bottom and the sides a little more vertical, and the upshot was that I ended up with two of the old, discontinued ones lying around in my office taking up space. I knew just what to do with them. 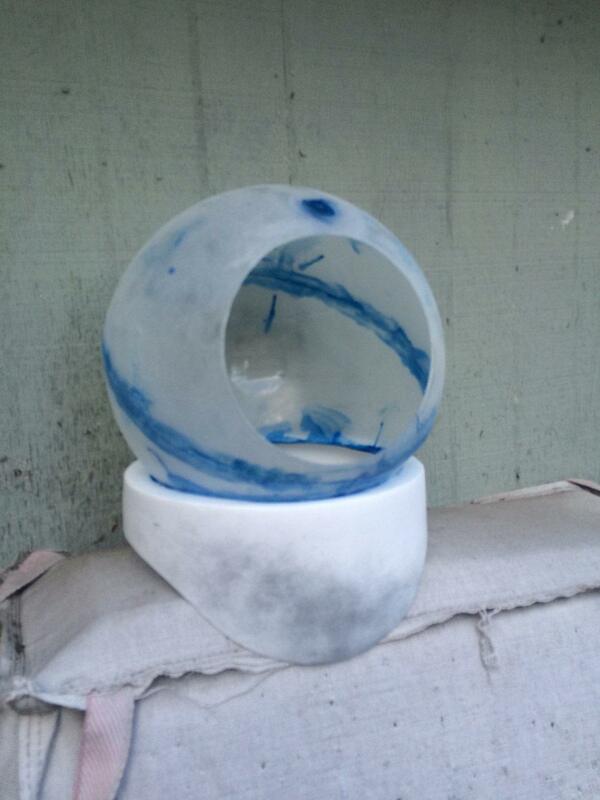 What would you do with two perfect hemispherical bowls about 12″ in diameter? Now, what would you do with them if you happened to already own a gorilla suit? Of course you know where this is going. ROBOT MONSTER! One of the all-time great bad movies, a classic episode of MST3K, a movie so bad that urban legend holds that the director attempted suicide due to the public failure and critical lambasting (the attempt was actually because he was despondent about not getting paid for the film and not being able to get another job in the industry; he later laughed and said Robot Monster was far from the worst movie he’d ever made), Robot Monster is a landmark film worthy of tribute. George Barrows provides an awkward interruption. The title character is played by veteran gorilla-man George Barrows, who got the role primarily because he owned a gorilla suit and was willing to do the movie for cheap. It was shot over a couple of weeks in the Bronson Canyon area, mostly because it was cheap to film there. 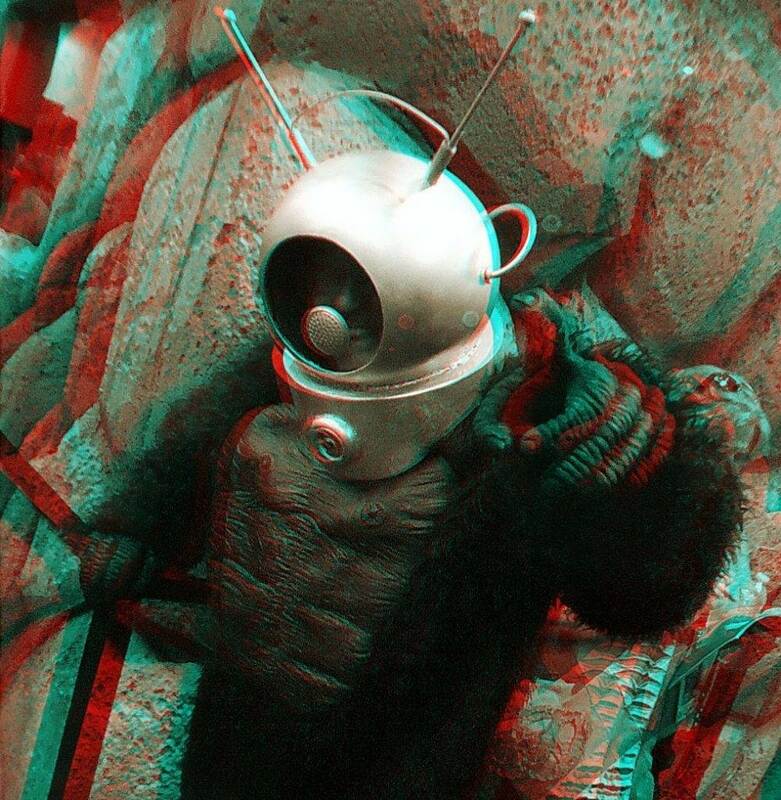 Amazingly for such a cheapo production, it was shot in 3D, on a total budget of about $16,000, and despite being considered a bomb, it grossed over a million bucks in its first year, and continues to be screened worldwide over 60 years later (it was released in 1953). It’s also one of the most unintentionally funny movies ever made. 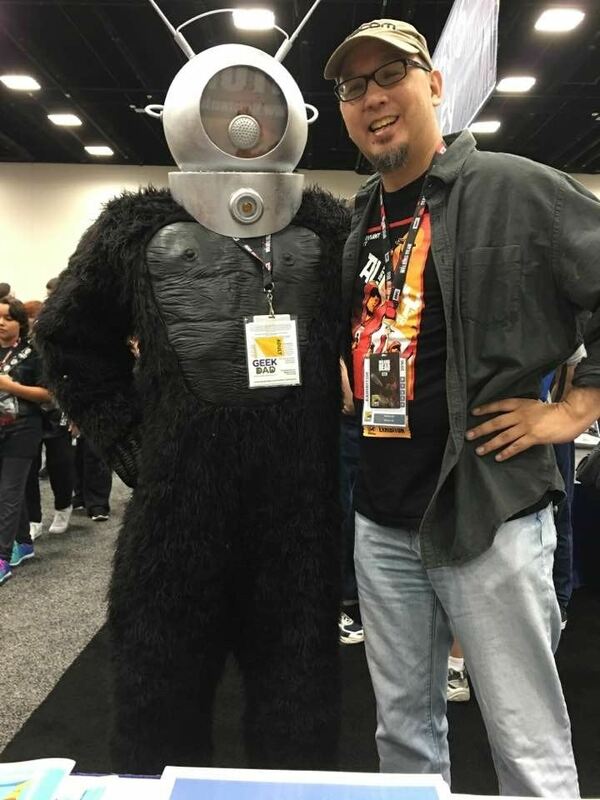 Here’s how I built my own Robot Monster costume, which was a big hit at the 2016 San Diego Comic-Con. Of course it starts with a gorilla suit. I had bought mine a few years ago on clearance at an after-Halloween sale at Target; I needed it for National Gorilla Suit Day. Of course, you’ll also need one for National Gorilla Suit Day (which is coming up at the end of the month; it’s always January 31, but you knew that), so pop on over to Amazon and get one already. The helmet is the tricky part; I happened to luck into the two merch bowls, but other would-be Ro-Men have used plastic fishbowl light fixtures, or formed the globe from paper maché around a balloon or beachball. First I cut a hole about 9.5″ for my head, then glued my two bowls together with PVC cement, then ground off the seam and plastered it over with Bondo. Lots of sanding followed. I scribed a circle on the sphere about 7″ to serve as the opening for the faceplate, then cut it out with my handy-dandy Dremel tool. For the base of the helmet, I got a 5 gallon plastic bucket from Orchard Supply Hardware. I measured the circumference of the bucket and drew a template for the collar in Adobe Illustrator; I printed it out and wrapped it around the bucket as a guide for cutting. Originally, I planned to just cut the bottom of the bucket into shape, but it was actually slightly tapered on the sides, and the bottom seemed a little too small in proportion to the globe. I ended up cutting off the top of the bucket just below the handle and inserted the bottom piece into it upside-down, filling the gap with scraps of 1/4″ foamcore and then smoothing over the whole thing with Bondo. 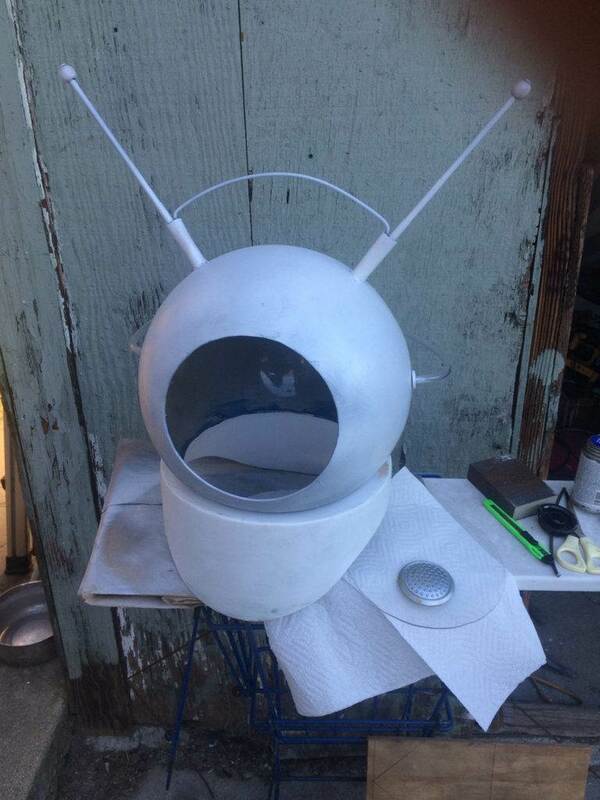 Antennas and tubes added, faceplate assembled and ready to install. I glued a piece of 1/8″ clear plexiglass in place for the faceplate after drilling a ventilation hole where the mouthpiece would go. The mouthpiece was actually one of the most difficult parts. In the movie, the mouthpiece is part of an old telephone, but old telephones are hard to come by. I found an electronics scrapyard that had some old phones in inventory, for about $10 a pop. Before I could get over there to pick one up, I found a solution in the form of a hairbrush. I had this little folding hairbrush that I’d picked up from the dollar bin at some store, which I used to keep in the center console of my car; on this day, I had pulled it out to try to tame the tangled mess on my head as a result of driving a convertible (it’s LA, it’s practically the law), and realized it was exactly what I needed. I tore it apart, pulled all the bristles out of the rubber base, spray-painted it silver, and hot-glued it in place on the faceplate. It was perfect. There’s an ornamental piece on the front of the collar, and at first I wasn’t sure what to do there; It looks like the original helmet from the movie had used the earpiece from the same telephone, but I needed another idea. Somebody, possibly my bride, suggested a yogurt cup. I saved one from lunch, trimmed it to match the curve of the bucket, then cut a hole in the middle, into which I shoved a plastic insert from the end of a roll of paper from work. I hot-glued a flattened marble in the middle as a gem. At some point, I may insert an LED behind the marble and make it light up. The only thing missing was the antennas. I checked a few thrift stores for old TV rabbit-ears, but couldn’t find any. I needed an alternate solution. Of course, as an archery instructor, I have piles and piles of arrows of all sizes, so I grabbed some strays and started cutting. Aluminum arrows come in a variety of sizes, so I started with two 1214 size arrow shafts (the 1214 size is 3/16″ outside diameter); I slipped them into shorter segments of 15/64″ shafts and put those into even shorter segments of 17/64″ ones. I glued them together, drilled holes in the helmet, inserted 2″ deck screws and hot-glued the antennas onto them, then slipped 3/8″ diameter rubber hose over them for the base. 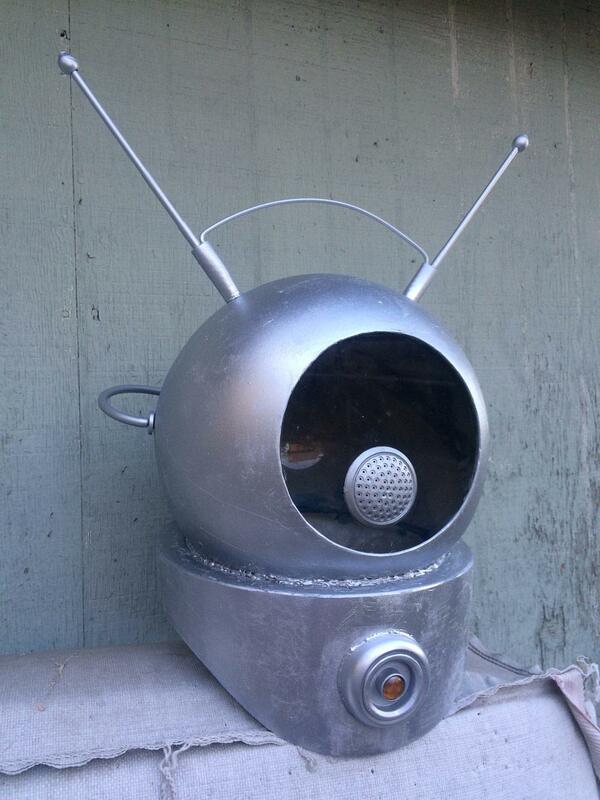 Wooden beads glued to the ends and a chunk of wire to connect them, a couple of coats of silver spray paint and the helmet was done. The only thing left to do at that point was find something for my feet. My cheap gorilla suit didn’t come with feet, and I had already spent enough on Bondo and buckets and miscellaneous bits and pieces. But I had an old pair of sneakers and some scrap fake fur, so I whipped up some feet. I replaced the shoelaces with elastic shock-cord to turn them into slip-ons (something I may end up doing with my regular shoes; it works great), then cut out and hot-glued fur over them. My scrap fur was brown, but a can of black spray paint fixed that. I had some large chunks of packaging foam, so I glued it inside the chest and shoulders of the gorilla suit to make it bigger and look more like Barrows’ version. Of course, that makes the costume super-hot; I didn’t know I could sweat that much. A cold-vest may need to be added. On the convention floor with cartoonist and storyboard genius Benton Jew. At the con, I wandered the floor for a bit, ending up at the booth for the Hollywood Science Fiction Museum, where I ended up posing for photos for almost an hour, then stopped at various booths occupied by nerdy friends who I knew would appreciate it. Cartoonist Scott Shaw! asked me if I would make a surprise appearance at his Oddball Comics panel the next day, so of course I did. Here’s the video of me showing off limited-edition canvas prints of some classic Oddball Comics covers. UPDATE: Corrected the name of the Hollywood Science Fiction Museum and added a link to their site. Check ’em out. Heh, I guess it does it automatically.